News just in from Simpson Marine that they've signed a joint listing for sale on the 32.3m motor yacht Aquarius S with Yacht Marketing Ltd.
Aquarius S was built by Falcon Yachts in 2002 to RINA class and is MCA compliant. An interior in American cherrywood offers accommodation for up to 12 guests in five staterooms and twin 2280hp MTU engines give her a cruising speed of 20 knots. 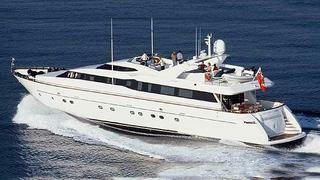 Lying in Singapore, Aquarius S is asking US$2,975,000.